ECHORD++ will present five prototypes in the EU Exhibition Area within the IROS: CLARC, EXOTRAINER, LINarm++, SIAR, and ANYmal (MODUL) with its own booth in the main exhibition area. Do not forget to mark the ECHORD++ Forum on Wednesday, October 3rd at 4:30 p.m in your calendars. on October 3rd from 16:30 to 18:00 Room 1.R.3 – La Habana NEW ROOM NUMBER!! 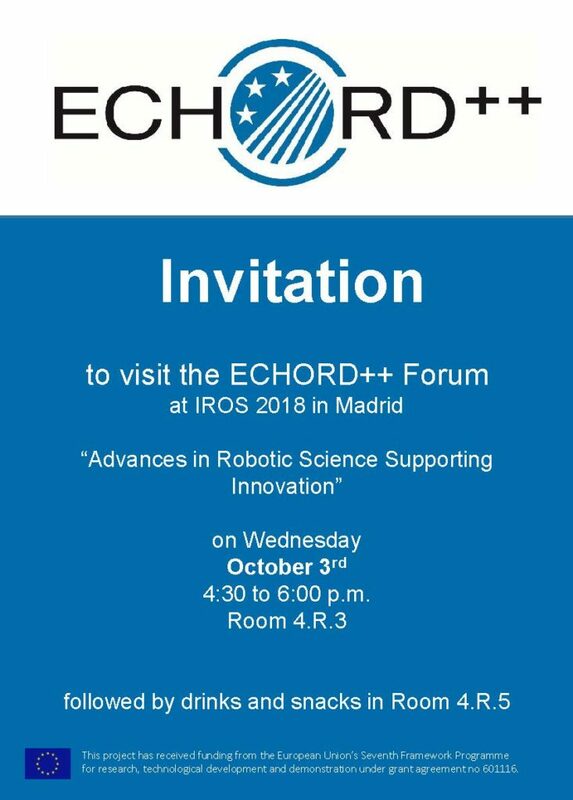 This forum will be sharing the innovative results of 35 robotic experiments financed under the ECHORD++ European Project and the lessons learned in the innovative procedures developed during the past five years.